Shop On Stage Microphone Stand Carry Bag from AMS and enjoy Fast & Free Shipping. 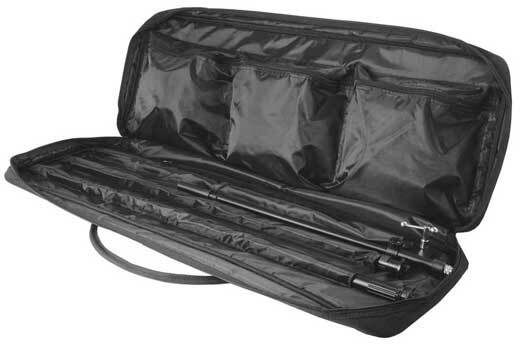 The On Stage Microphone Stand Bag, a must for bands, is a rugged nylon bag with enough pockets for either 3 round base mic stand bases, 3 hex-base mic stand bases or any combination of both. This bag is also constructed with specially-designed pockets for the 3 accompanying shafts. Includes extra tough nylon hand straps for convenient handling. For nearly 20 years, The Music People! Inc. has been on of the nation’s leading suppliers of microphones and pro audio equipment. The Music People! Inc. also owns and manufactures On-Stage Stands® support stands. Founded on a promise of quality, innovation and customer service, The Music People! Inc. is committed to the needs of music professionals throughout the world. This bag was exactly what I needed for my gig!! it's sturdy, holds at least 2-3 more stands. I'm glad I got this bag. It holds more than 3 stands, it's easy to carry when its full, and it keeps mic stands from getting "misplaced". Great product will probably get another one. The bag is OK, but suffers from a lack of strapping inside to hold the mic stands. Also, there is not adequate room to properly hold all the pieces of the stands. At the same time, there is more than ample zipper compartment space for cable and miscellaneous small parts -- but the small parts could more helpfully be stores in smaller compartments. Finally, the quality of the bag material is such that it is unlikely to stand up to the stresses of road travel. Mine will be stored in a closet and only opened occasionally. If I were still into doing regular gigs, I would be concerned about the bag holding up for a year of being schlepped around.